Hello Loves. It's been a minute since I've done a Couture Gel Polish color comparison post. I've finished swatching all of the blues in the Couture line, but I don't think I've shown them all to you. 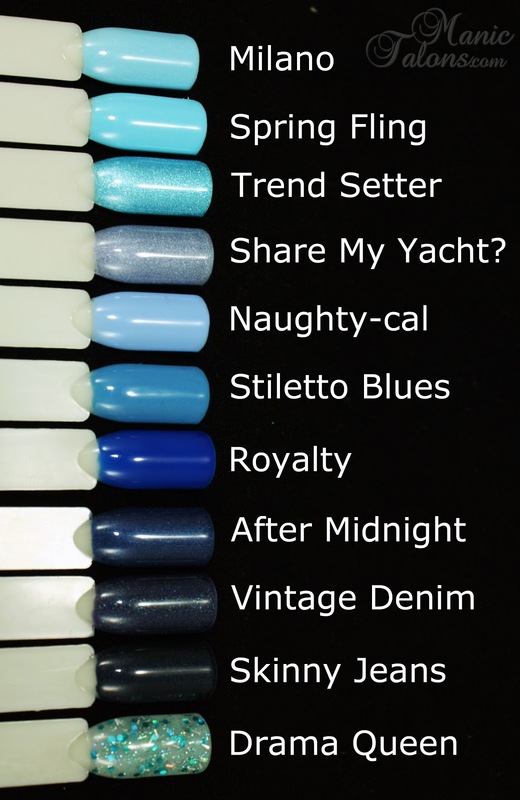 I'm a huge fan of blue, and Couture has some lovely shades! Eleven of them, to be exact. Some of these I have purchased myself, others I won via contests, and still others were sent to me by Couture as part of a swatching project I have been working on for the past 4 months. Ready to see them? All swatches featured are 3 thin coats for consistency. Milano is a bright, light blue shade with a subtle shimmer. Application is nice and I found it opaque in two coats. Spring Fling is similar in tone to Milano, but is slightly lighter and is a pure cream. 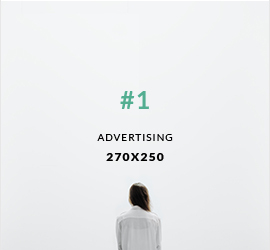 This one is also opaque in two. Trend Setter is an amazingly shifty blue frost. Trend setter was a bit tricky to apply without streaks as is common with frosts. While opaque in two, I found that a third, super thin coat took care of any streaks. Share My Yacht is also a shifty frost. This one appears blue in some light and purple in others. I have included it in the blues here, but will likely feature it with the purples at some point as well. I simply can't decide where it really fits. Also opaque in two, like Trend Setter, a third thin coat helps eliminate any streaks from the frosty finish. Naughty-cal is a lavender toned blue cream. Naughty-Cal required three coats to be completely opaque for me. With two I could still see a faint visible nail line. Stiletto Blues is also a cream, but this one is muted with grey undertones. Like Naughty-Cal, I found this one needed three coats to be completely opaque. Royalty is an incredible, royal blue jelly. Three coats still shows a bit of visible nail line as is common with a jelly finish. After Midnight is a deeper blue that borders on a light navy with a deep silver shimmer. After Midnight is extremely opaque and perfect in two coats. It can easily be used for nail art with one coat over a base color. This is how it looks in direct lighting. It is darker in average or indirect lighting and appears more navy. Vintage Denim is a faded version of After Midnight - similar to, well, vintage denim. This one takes on more of a muted navy tone in a jelly base. It is opaque in three coats, but will still show visible nail line in some lighting situations due to the jelly base. This one is also prone to shrinking, as is evident around the cuticle line. Shaking well and flash curing will lessen the effect. Cooling the gel may help as well, but I haven't tried it with this color yet. Skinny Jeans is a dark washed denim shade of navy with a dark blue shimmer. Like After Midnight, this one is opaque in two coats but can easily be layered for one coat nail art. Drama Queen is a gorgeous blue glitter topper with a slightly tinted, sheer blue base that is packed with small holographic glitter, holographic strips, and larger blue hexes. Finally, here they are side-by-side on natural swatch sticks. This one freaked my camera out a little since there is such a large range of colors, so it is taken in darker lighting than the swatches above. Hopefully it still shows the difference between each color and finish even being a little darker. I left this photo a bit larger (aka huge) so you can click on it to blow it up to see each swatch a little better. As a reminder, code ManicTalons is good for 10% off www.CoutureGelNailPolish.com. How do YOU blue? Do you prefer lights or darks? Creams or shimmers? 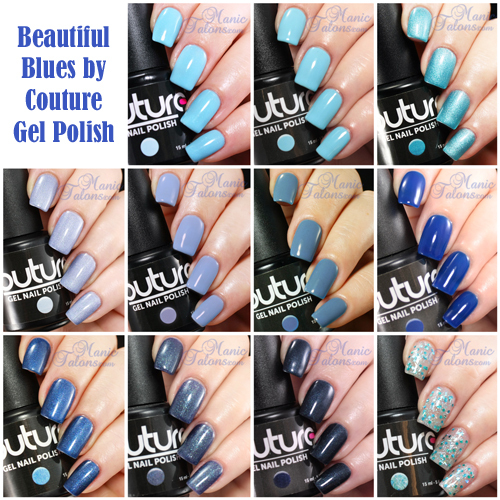 *This post includes items that were provided by Couture Gel Nail Polish for my honest review, in addition to some that I purchased myself and others that I won through contests. Skinny Jeans has to be my favorite. Great comparison post! My OCD self loves loves loves that bottom photo! Keep em coming! Skinny Jeans has been the one that I have had my eye on for a while, but they have other dark blue shades that are tempting, too. Regarding "Vintage Denim": NOW you tell me!!! I purchased and used this just a couple of days before your post. It pooled. It ran. It shrank. I tried everything I could think of. Used my Michelle directed Robart Shaker, flash cured as per Michelle's advise, cooled as per Michelle. Even gave it the evil eye just for good measure. So difficult to work with. But it looks OK at arm's length....................and it is just so doggone gorgeous in sunlight so I guess I will have to use it again!